I recently got an email from my sister, Cathy, asking me for menu ideas for her book club get together. She said she was crunched for time and had no time to run to the store. Basically, she wanted something that was quick and easy, using simple ingredients that she had on hand. She also had some fresh ripe peaches that she was hoping to use. At first, I suggested making my Fresh Blackberry and Mango Galette and substituting peaches, but she said she was hoping for "a small picky uppy thing" rather than something that is served on a plate. So I immediately googled a few things and quickly found this recipe. It's from another food blog called Browneyedbaker.com. As I told Cathy, it's one of those "How can this not be good?" recipes, and it has the same technique as the White Chocolate Raspberry Oatmeal Squares, which are super easy to make. Perfect! Cathy said the bars were a HUGE success! It was only AFTER everyone devoured them that someone said "oh, maybe we should have taken a picture of them so your brother can put them on his website!' LOL No worries, it gave me an excuse to make them! And now here they are. Thanx to Cathy and her book club for being recipe testers! And thanx to Michelle, The Browned Eyed Baker, for sharing such a fabulous recipe! 1. Preheat the oven to 375 degrees F. Grease a 9×13-inch baking pan. 2. For the Dough: In a medium bowl whisk together the flour, sugar, baking powder and salt. Use a pastry blender to cut in the butter, and then the egg. The dough will be crumbly. Pat half of the dough into the prepared pan. Place the pan and the remainder of the dough in the refrigerator while you prepare the filling. 3. For the Filling: Place the diced (or sliced) peaches in a large bowl and sprinkle with lemon juice. Mix gently. In a separate bowl whisk together the flour, sugar, salt, cinnamon and nutmeg. Pour over the peaches and mix gently. 4. Spread the peach mixture evenly over the crust. 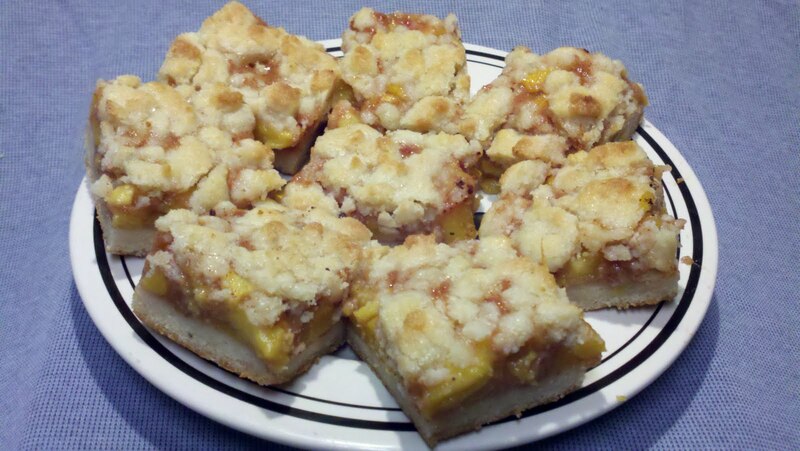 Crumble the remaining dough over the peach layer. 5. Bake in the preheated oven for 45 minutes, or until the top is slightly brown. Cool completely before cutting into squares. Instead of cutting the butter into the dough with a pastry blender, I just threw everything into a food processor and pulsed it until the dough came together. I also added WAY more cinnamon to the peach mixture because, frankly, you can never have too much cinnamon. I also added a touch more sugar because my peaches were a little bit tart. My oven bakes hot, so I only baked them for a half hour. Seriously, its a wonder I can get anything to turn out with that oven. But I digress.... Just be sure to check them so you don't over bake them! Instead of serving it as a "picky uppy thing", serve it warm out of the oven on a plate, topped with a scoop of vanilla ice cream. Substitute any other fresh fruits for the peaches. (or any combination of fruits). Cathy made them a second time, and didn't have enough peaches, so she added blueberries to make up the difference. Deelish! I bet mangoes or apples would also be fabulous.